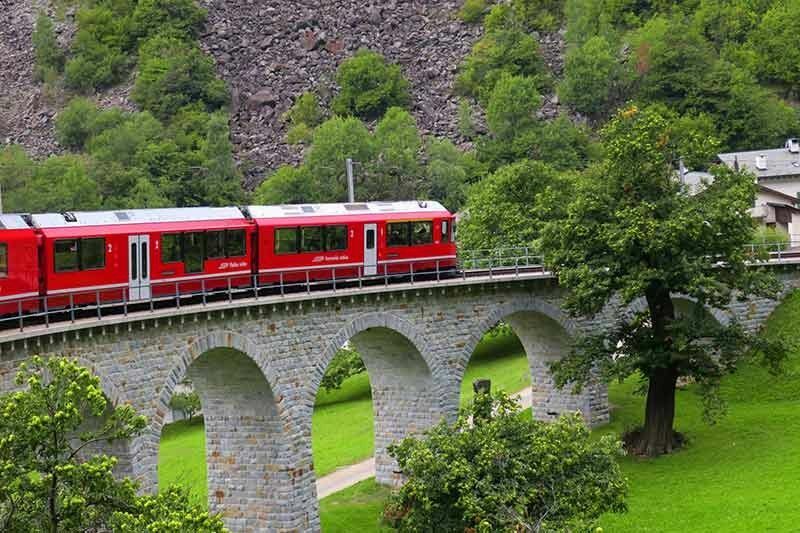 On our first visit to Switzerland, we fell in love with the experience of rapidly rolling along fairy-tale Alpine scenery onboard the Bernina Express. Our favorite train feature was the Brusio Spiral Viaduct, a single-track arched stone spiral railway viaduct, where the train traveled over, around and beneath its own pathway shaped like a coiled serpent. Riding this train felt like we were going to Narnia dressed in warm- weather clothes because in September, the weather in southeastern Switzerland is still pleasant and mild. Two gleaming lakes came before us, the “Black Lake” Lej Nair and the “White Lake” Lago Bianco. Approaching the Landwasser Viaduct, the highest bridge on the railway. After barrelling through a mountain cave, we went right into a 213-feet high, six-curved-arch limestone bridge. Since we made sure to sit on the last wagon, we had a great view of the striking red train barrelling through bridges and tunnels. What’s unique about the Bernina Express was that we did not even need to dirty our shoes to see the best views. We could just enjoy a journey across the Alps in the warm confines of our cabin. View along the Ospizio Bernina, the highest point on our route at 2253 meters. Riding this railway car felt like we were going to Narnia but dressed in warm weather clothes. Crisp, fresh air wafted from the crack of our window. We saw cows grazing on the grass with lush Swiss meadows as their backdrop. MY HUSBAND Jovi and I were in Switzerland to experience what pioneering Londoners did almost 150 years ago–enjoy the Swiss Alps. 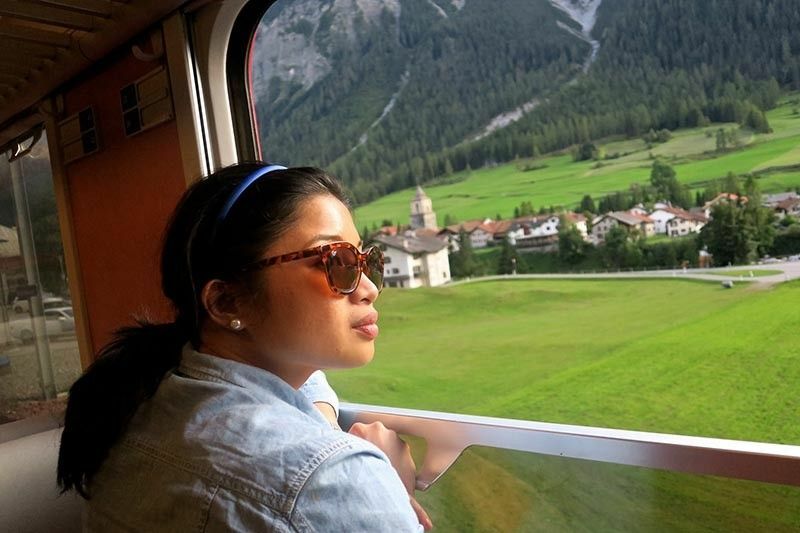 We were riding the Bernina Express, known as one of the world’s most scenic train rides. Our excursion started in Chur, eastern Switzerland to Tirano, northern Italy, passing over 144 kilometers across 55 tunnels and 196 bridges. Along the way, we would gain and lose elevation through frozen mountain peaks, blue-green lakes, and forested hills. 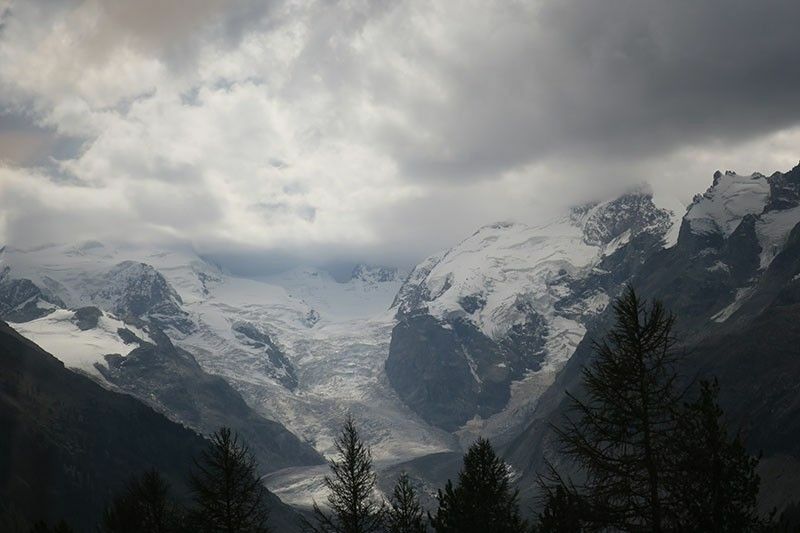 Opened in 1904, the Rhaetian Railway (RhB )'s Bernina /Albula landscapes were part of the Unesco World Heritage list. 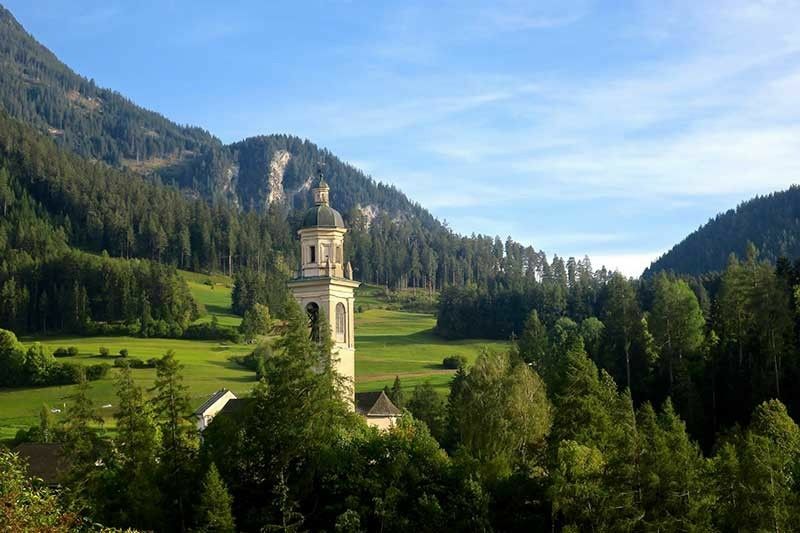 These two transalpine routes were engineering marvels that not only changed the lives and economy of mountain towns in the 20th century, but also enhanced the Swiss Alps' beauty. When we were planning the trip, another frequent traveler told us that it was a “shame to pass through the Engadin Valley without stopping.” Following that advice, Jovi and I spread our trip over a couple of days. What’s unique about the Bernina Express is that we did not even need to dirty our shoes to see the best views. We could just enjoy a journey across the Alps in the warm confines of our cabin. We boarded the red train in Chur, Switzerland's oldest town located in the canton of Graübenden. Riding this railway car felt like we were going to Narnia but dressed in warm- weather clothes. 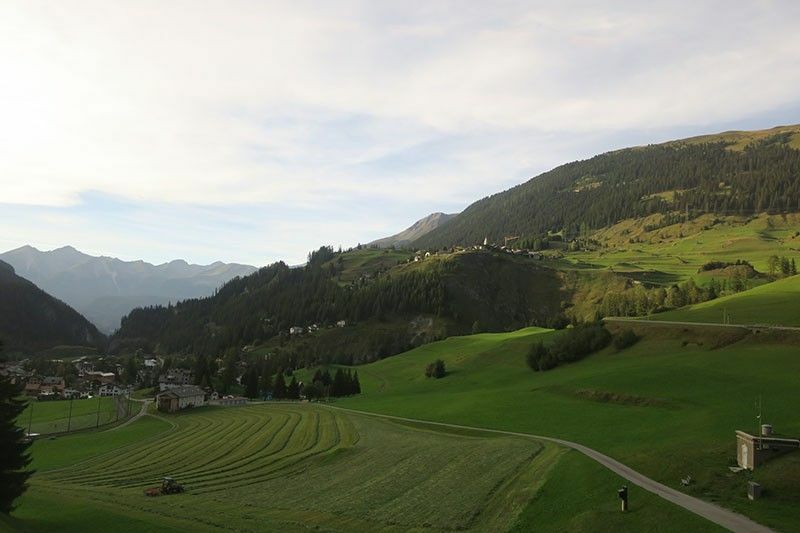 In September, the climate in the southeastern part of Switzerland was still pleasant and mild. Crisp, fresh air wafted from the crack of our window. We saw cows grazing on the grass with lush Swiss meadows as their backdrop. Soon, our engine started approaching the Landwasser viaduct, the highest bridge on the railway. After barrelling through a mountain cave, we went right into a 213-feet high, six-curved-arch limestone bridge. Since we made sure to sit on the last wagon, we had a great view of the striking red train barrelling through bridges and tunnels. At the beginning of the 20th century, a thousand workers excavated the 5,864-meter-long Albula tunnel mainly by using shovels. They managed to finish it within five years. 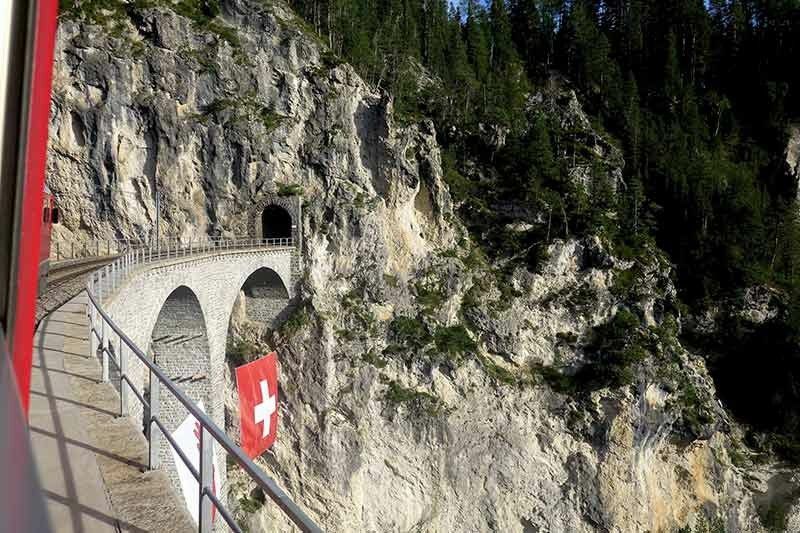 Another proof of Swiss ingenuity that keeps the railway from slipping on the way up or losing control on the way down was the required seven percent grade. Another favorite feature was the Brusio spiral viaduct, a single-track arched stone spiral railway viaduct, where the train traveled over, around and beneath its own pathway shaped like a coiled serpent. In our hometown of Cebu, there was a hotel and restaurant with rustic interiors and framed panoramic shots of the Swiss Alpine country called St. Moritz. But on this trip to Switzerland, we got to step foot in the real St. Moritz, where Alpine winter tourism was born thanks to Badrutt. The 1977 film, The Spy Who Loved Me, had James Bond dash down ski slopes here. Despite the assumed high price tag, we found a good deal in Hotel Randolins. For $100 a night in their hostel annex, our stay included the Engadin Pass, a 48-hour pass for all modes of transportation in the area. We used it to ride a cable car up to Muottas Muragl, a summit with gorgeous views: snow-capped mountains carved from glaciers and bottomed out with lakes in different shades of blue. Quaint towns were surrounded by emerald green grass. We felt uplifted by the view baked in sunshine. Revived by our restful stay in St. Moritz, we were ready to continue our trip to Tirano. Within an hour, the train arrived at the highest point of our route, Ospizio Bernina. 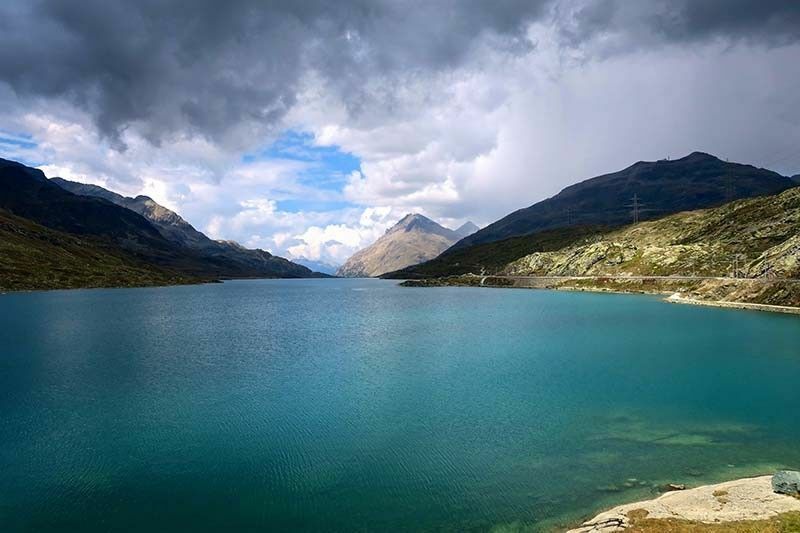 I gasped as two gleaming lakes came before us, the “Black Lake” Lej Nair and the “White Lake” Lago Bianco. We had a moving visual to enjoy while we ate the local specialty, the Engadine tart filled with caramel, cream, and walnuts. Soon we were descending to Poschiavo Valley, on the way to the sun-drenched northern Italian town of Tirano. We were leaving the sublime views of Europe’s famous mountain range for palm trees, green forests and ornate vineyards. “We don’t have to ride other trains anymore,” Jovi said after the trip. 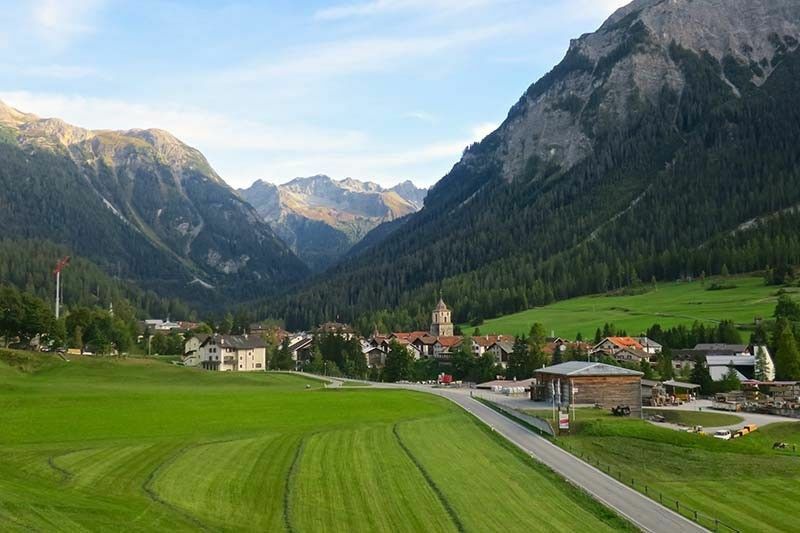 On our first visit to Switzerland, we fell in love with the experience of rapidly rolling along fairy-tale Alpine scenery onboard the Bernina Express.“This tops them all,” he added.